Boil Fruit'Purée Blackcurrant Capfruit, add agar agar and sugar, and boil out for 1 minute. Leave to set in refrigerator and blitz into gel. Bring to a boil cream, take off heat, add pine needles and leave to infuse for 2 hours. Strain and rescale to 160 g.
Add Trimoline® and bring to a boil. Create dry caramel with sugar and isomalt. Add roasted pine nuts, pour onto silpat and leave to cool. Blitz into fine powder and sieve onto silpat mat to create small circles. Bake in over until powder melts into a disk. Spray one side of mould green, the other purple. 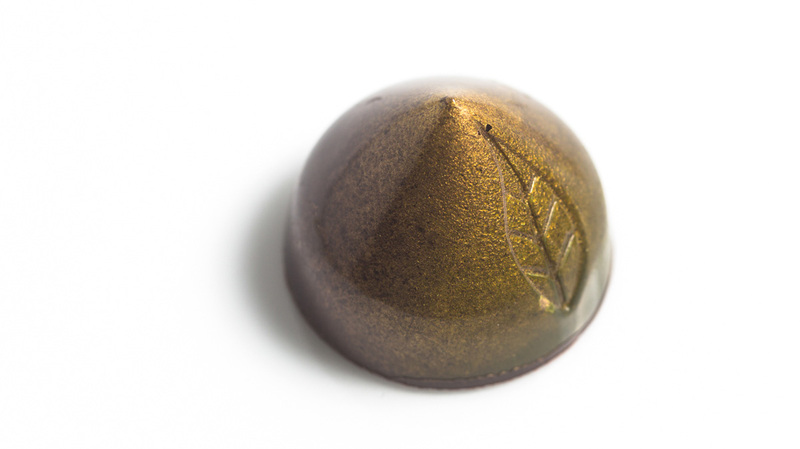 When set, dust with gold lustre and line with Cacao Barry® Origin dark chocolate couverture Venezuela 72% cocoa. Pipe small bulb of cassis gel into mould. Pipe soft ganache on top. Place pinenute nougatine disc in top of ganache and finish off with Cacao Barry® Origin dark chocolate couverture Venezuela 72% cocoa.